Production doesn’t happen by magic. Think about hosting a large party for your parents’ anniversary. The first thing you have to do is find a location that is large enough to accommodate all the people you will be inviting. Once you have identified the location, you then need to visit the site and decide how it will be laid out. Where should the tables and chairs go, where will you set up refreshments, and what about a gift table? Once you’ve decided on the layout, then you need to start making a list of the materials you’ll need for the party. This includes everything from plates, cups, and napkins to hiring a DJ and a caterer. Lastly, based on the number of guests, you’ll need to calculate how much of everything—food, drinks, etc.—to order. Operations managers engage in similar planning, but they use different terminology to describe the different parts of the plan. In production planning, the components are facility location, facility layout, materials-requirement planning (MRP), and inventory control. The next step, after planning the production process, is deciding on plant layout—how equipment, machinery, and people will be arranged to make the production process as efficient as possible. The primary aim of facility layout is to design a workflow that maximizes worker and production efficiency. Facility layout is complex because it must take into account the available space, the work processes, the delivery of components and parts, the final product, worker safety, and operational efficiency. A poorly laid-out production facility creates inefficiencies, increases costs, and leads to employee frustration and confusion. The four most common types of facility layout are process, product, cellular, and fixed position. In a product layout, high-volume goods are produced efficiently by people, equipment, or departments arranged in an assembly line—that is, a series of workstations at which already-made parts are assembled. A cellular layout is a lean method of producing similar products using cells, or groups of team members, workstations, or equipment, to facilitate operations by eliminating set-up and unnecessary costs between operations. Cells might be designed for a specific process, part, or a complete product. The goal of cellular manufacturing is to move as quickly as possible and make a wide variety of similar products with as little waste as possible. This type of layout is well suited for single-piece and one-touch production methods. Because of increased speed and minimal handling of materials, cells can result in great cost and time savings and reduced inventory. It is easy to move marshmallow candies around the factory while you are making them, but what about airplanes or ships? For the production of large items, manufacturers use fixed-position layout in which the product stays in one place and the workers (and equipment) go to the product. To see an excellent example of fixed-position layout, watch the following video that shows how Boeing builds an airplane. After the facility location has been selected and the best layout has been determined, the next stage in production planning is to determine our material requirements. Material-requirements planning (MRP) is a production planning, scheduling, and inventory control system used to manage manufacturing processes. Most MRP systems are software-based, but it is possible to do MRP by hand, as well. Some manufacturing firms have moved beyond MRP systems and are now using enterprise resource planning (ERP) systems. ERP systems provides an integrated and continuously updated view of core business processes using shared databases maintained by a database management system. ERP systems track business resources—cash, raw materials, production capacity—and the status of business commitments—orders, purchase orders, and payroll. The applications that make up the system share data from and between various departments (e.g., manufacturing, purchasing, sales, accounting, etc.). ERP facilitates information flow between all business functions and manages connections to outside stakeholders. Even with the implementation of highly integrated planning software, operations managers still need to plan for and control inventory. Just-in-time (JIT) manufacturing is strategy that companies employ to increase efficiency and decrease waste by receiving goods only when they are needed in the production process, thereby reducing inventory costs. In theory, a JIT system would have parts and materials arriving on the warehouse dock at the exact moment they are needed in the production process. To make this happen, manufacturers and suppliers must work together closely to prevent just-in-time from becoming just-isn’t-there. Operations managers must accurately forecast the need for materials, since even the slightest deviation can result in a slowdown of production. As you might expect, operations managers find that complex processes involve complex planning and scheduling. 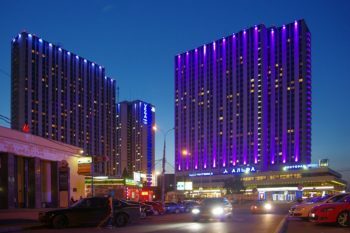 Consider the Izmailovo Hotel in Moscow shown in the photograph at the right. Built to house athletes during the 1980 Olympics, the complex has 7,500 guest rooms and is the largest hotel in the world. Think about cleaning all those rooms—in four thirty-story-high towers—or checking in the thousands of guests. No small operation! Although the Izmailovo doesn’t produce a tangible good, it relies on many of the same operations management principles used in manufacturing to stay in business. To increase operational efficiency in complex processes like those of running a giant hotel, operations managers use three common planning tools: Gantt charts, PERT, and the critical path method (CPM). A Gantt chart is a timeline. Multiple projects can be added to the timeline with start and finish dates, and milestones and deadlines are also reflected. This chart is used to determine how long a project will take, the resources needed, and the order in which tasks need to be completed. Gantt charts are useful when the production process is simple and the activities are not interdependent. For more complex schedules, operations managers use PERT, which stands for “program evaluation and review technique.” This is a method of analyzing the tasks involved in completing a given project, especially the time needed to complete each task and to identify the minimum time needed to complete the total project. PERT was developed primarily to simplify the planning and scheduling of large and complex projects. The key to this technique is that it organizes activities in the most efficient sequence. It can also help managers determine the critical path, which is discussed below. The critical path method (CPM) is a step-by-step technique for process planning that identifies critical and noncritical tasks in order to prevent time-frame problems and process bottlenecks. The CPM is ideally suited to operations consisting of numerous activities that interact in a complex manner. It’s often used in conjunction with PERT. 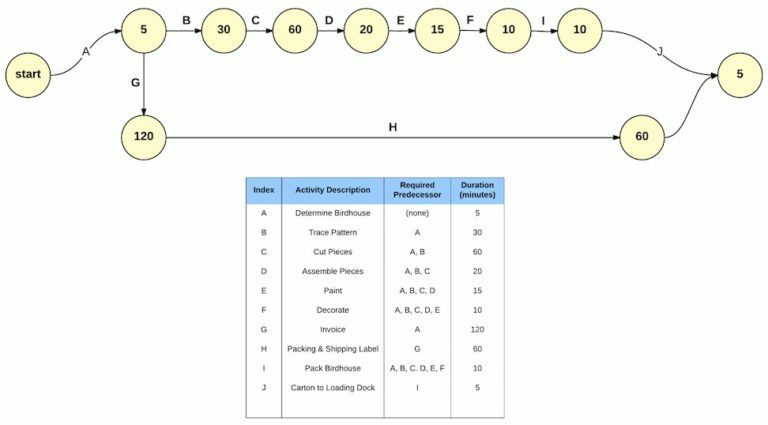 Using these values, CPM calculates the longest path of planned activities (expressed in time) to logical end points or to the end of the project, and the earliest and latest that each activity can start and finish without making the project longer. This process determines which activities are “critical” (i.e., on the longest path) and which can be delayed without extending the overall project duration. Take a look at Figure 2, below. What was the critical path in our construction of a birdhouse? Our critical path was the path that took the longest amount of time! This was sequence of activities that included the customer invoice and packing and shipping label (from the start to G to H), which totaled 180 minutes. 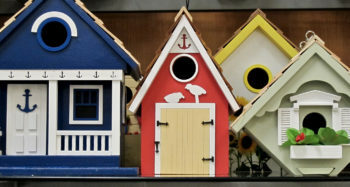 The problem is that even if we were able to assemble and decorate the birdhouse faster, the birdhouse would just and wait for the paperwork to be completed. In other words, we can gain efficiency only by improving our performance in one or more of the activities along the critical path. PERT was developed by the U.S. Navy. The Navy’s Special Projects Office devised this statistical technique for measuring and forecasting progress while they were designing the Polaris-Submarine weapon system and the Fleet Ballistic Missile capability. CPM was first used for major skyscraper development in 1966 for the construction of the former World Trade Center Twin Towers in New York City.